Another Sunday, and here is another idea for Sunday Breakfast! This time it is a well-balanced, healthy and very tasty buckwheat porridge, that makes a fantastic breakfast treat. I guess many of you need something special to pull yourself out of the bed in the cold autumn mornings, and this warm and cozy porridge does help you! I used for it buckwheat flakes mixed with some oats. Do you know, that buckwheat grain provides a very high level of protein, second highest only to oats! 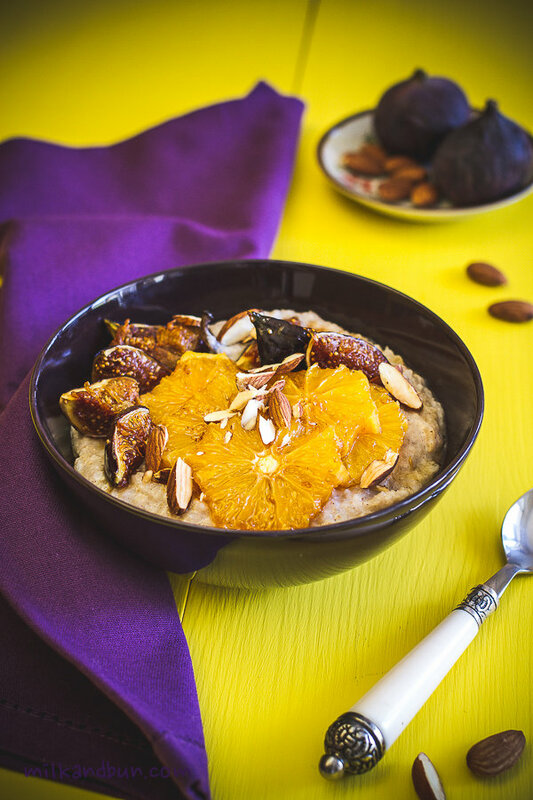 It makes this porridge high in energy, so it might help you to do more housework during the day or just stay in a good mood! 😉 For those of you who not especially concerned with buckwheat nutritional benefits, it is also tastes delicious and has a delightful nutty flavour. 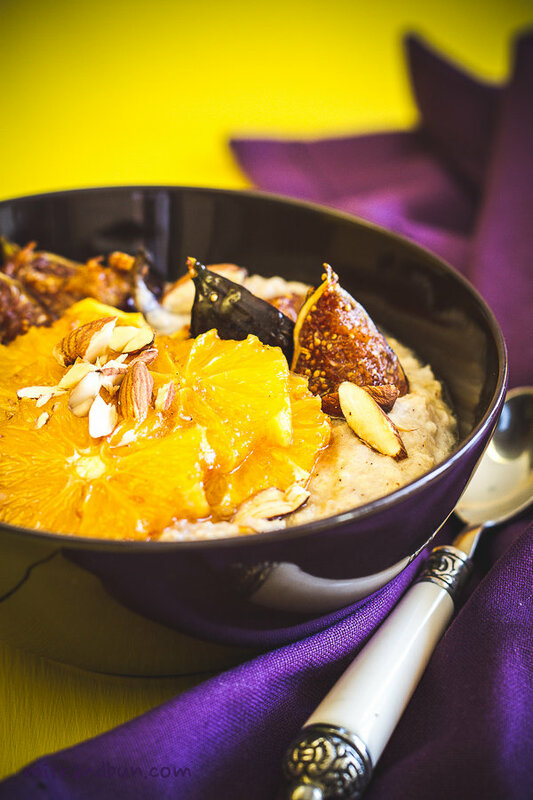 Plus, I topped the porridge with caramelized orange slices and figs, now you can imagine how divine and irresistible it was! Some chopped almonds or hazelnuts add an extra nice and crunchy note to your morning breakfast bowl! You may drizzle the porridge with honey. Put the water and milk in a saucepan over a medium heat, when it just begins to boil, add buckwheat flakes, oatmeal and all other ingredients for the porridge. Stir to combine. Reduce the heat to low, simmer for 5-6 minutes, stirring occasionally. If the porridge is too thick add more milk or water. Turn off the heat, cover with a lid and leave for 4-5 minutes. Meanwhile, put a pan with sugar on a medium-high heat. Don’t stir it, allow to become lightly golden. Add figs and orange slices, caramelize for 2-3 minutes on each side. Turn the heat off. Take out figs and orange slices. Add lemon juice to the pan and stir with all sugar and juices in the pan. 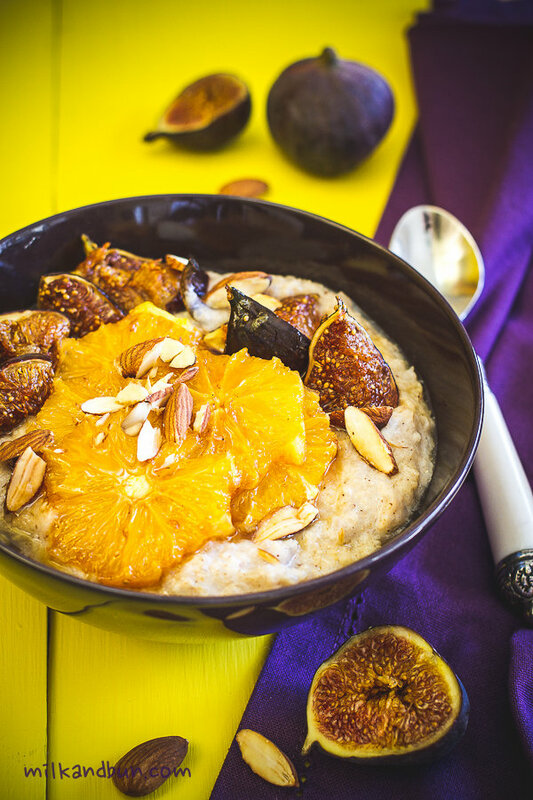 Spoon the porridge into bowls and top with figs and orange slices. Pour over the sweet juice from the pan. Sprinkle with almonds. Enjoy warm and cozy breakfast! Oct18October 18, 2015 • By milkandbun • This entry was posted in Breakfast, Grains, Healthy choice and tagged autumn recipe, breakfast, buckwheat, buckwheat flakes, buckwheat porridge, caramelized orange and figs, cooking, delicious, fall recipe, food, food and recipe, food photo, food styling, gluten free porridge, healthy cooking, healthy recipe, morning porridge, photography, photos, porridge, recipe, Russian kasha, Sunday, Sunday breakfast, weekend, weekend cooking. Bookmark the permalink. Gorgeous photos and amazing food! Thanks, dear Lynz! I think a bowl of porridge is always good any time of the year! Very tasty for a relaxing breakfast! I’ve never seen porridge look this good!! I loved the addition of caramelized orange and figs! Yum!! Well Mila – if you’re going to come late to the party – best to bring breakfast!!! 🙂 And what a great breakfast. Love the fruit and I’m guessing the combination of buckwheat and oats is fantastic. Hi, Wow! I’m thinking that you really should do a video tutorial, your porridge is amazing. Would love to be your neighbor. Hello-hello! Honestly, never thought it can be interesting- video how to make a porridge… 🙂 It’s really easy: pour a water/milk in a pan, just before it starts boiling – add oats/buckwheat, then you need to stir it almost all the time on a low-medium heat. Than top with something you love and enjoy! wow. porridge is porridge. but this is porridge on crack! stunning! Aaaah you’re so kind and sweet, Mimi! Thank you so much for your lovely comments! You certainly have some wonderful ideas for great breakfasts! Most important meal of the day. Breakfast is my favorite meal (as long as I don’t have to cook it) but my absolute favorite breakfast would be crepes with raspberry on top. I just started cooking with Buckwheat!! this is so amazing~ I love your space!! your blog is soo good! !